Although newly named, the Munster area is one of the oldest in the City of Cockburn’s long history. During the late 19th century, the area was known to settlers as ‘South Coogee’, and its lake was originally known as Lake Munster, named for Prince William, the Earl of Munster. This lake area (now Lake Coogee) was good market-gardening land, and many small holdings grew up around its shores. 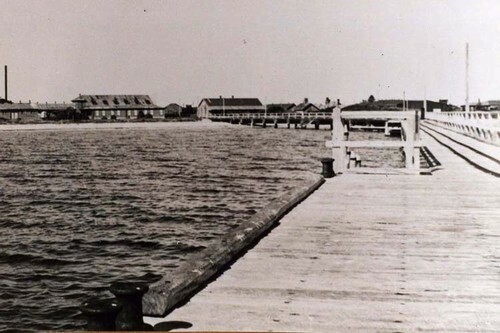 Long before this, however, Woodman Point played host one of the first settlements in WA: Thomas Peel’s failed experiment in community-building, Clarence. Peel, his family, and several ships full of settlers landed in Jervoise Bay on New Years’ Eve, 1829, intending to recreate the village life that was fast disappearing in England. Plagued by bad luck, insufficient supplies, and a lack of understanding of the land, the new settlement was abandoned within two years and Woodman Point remained empty for many years to come. In 1864, the entire Munster area was taken up as a pastoral lease by George Lourey Ellis. Keeping the rough grazing land for sheep and cattle ensured a good return for new settlers, as the colony at Fremantle was always in need of meat, and so vast tracts of Cockburn land were kept largely free of buildings and developments. In the 1870s there was an attempt to settle some of the newly-arrived pensioner guards around Lake Coogee. These men had been brought to the colony to guard the convicts that had become financially necessary to keep the struggling colonists afloat. The settlement was not a success, as the guards were not skilled in keeping their own market gardens, and most preferred to be closer to Fremantle for their work and for socialising. In 1886, a quarantine station was built on the promontory at Woodman Point, which would serve in various capacities for nearly a century, including through both World Wars. Throughout the 1880s and 90s a small enclave of market gardeners called South Coogee home. Theirs was one of the earliest gardening settlements in the Cockburn district, and it was flourishing well before Spearwood and Jandakot. Once those areas began booming in the early 1900s, South Coogee settled into a decline that was hastened when the Federal government resumed large swathes of the area around Lake Coogee and Woodman Point for a proposed naval base in 1913. Though the naval base was never completed, the land remained in Federal control and this stalled any growth the area may have been capable of. New and better roads were built around South Coogee, and most of its settlers had moved south to Mandogalup or Rockingham by the 1930s. Munster was officially named in 1954, and remains integral to the Cockburn district, housing the wastewater treatment plant and the cement quarry which were both built during the post-war industrial boom. Bordered by Spearwood and Coogee to the north, Yangebup and Beeliar to the east, and Henderson to the south, Munster spans the gap between residential, industrial, agricultural, and natural.